This handsome, 16-story apartment building was erected in 1925 and was converted to a cooperative in 1979. It has only 32 units. In their fine book, "George & Edward Blum, Texture and Design in New York Apartment House Architecture," (The Friends of Terra Cotta Press, 1993), Andrew S. Dolkart and Susan Tunick note that the Evanston apartment building at 610 West End Avenue was built by George F. Johnson Jr., and Leopold Kahn. 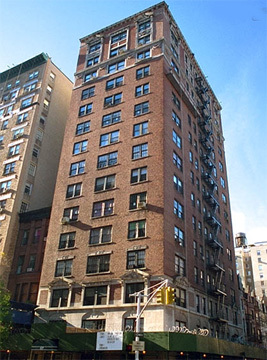 The Blums also designed the Admaston apartment building at 259 West 89th Street the same year for Johnson and Kahn. The Johnson-Kahn Company had previously built the Hendrick Hudson Apartments on Riverside Drive at 110th Street and the adjoining annex and the authors suggest that Edward Blum "may have been the designer" of these two major buildings for the architect of record, William L. Rouse. "George and Edward Blum were among a large number of Americans to study at the Ecole des Beaux-Arts. Most American students had little first-hand knowledge of Paris or of French language and culture and remained unaware of new design trends beyond those taught at the Ecole. The Blums' French parentage and their experience growing up in France set them apart from most of their compatriots. It appears that they gained a greater familiarity with contemporary French architectural practice than most Americans, for their early buildings indicate a range of French influences far greater than those generally acquired through study at the Ecole." "The manipulation of varied materials, especially the use of brick for decorative as well as functional purposes, exerted the most far-reaching influence on the Blums' apartment houses. Brick had been used extensively in French architecture, nobably in the Midi region, near Toulouse and Albi, where stone is scarce, and on major buildings erected throughout France dring the reign of Louis XIII in the early seventeenth century and during the nineteenth century. Although brick had not been a traditional building material in Paris, it became especially popular in the late nineteenth century for apartment buildings for the middle and working classes and for public buildings such as schools and baths," the authors continued. This building is quite modest in comparison to the Blum's flamboyant Evanston, notable for its very ornate and unusual fence and entrance metalwork. Still, this is a dignified and attractive, red-brick building that has a two-story limestone base. The canopied, step-down entrance leads to a paneled lobby and the building enjoys considerable "light-and-air" because the street to the north is composed of low-rise buildings. The building permits protruding air-conditioners and has inconsistent fenestration, no landscaping, no garage and has fire-escapes on its north facade. This is one of the most attractive areas along West End Avenue and is very convenient to Riverside Park and neighborhood shopping on Broadway.